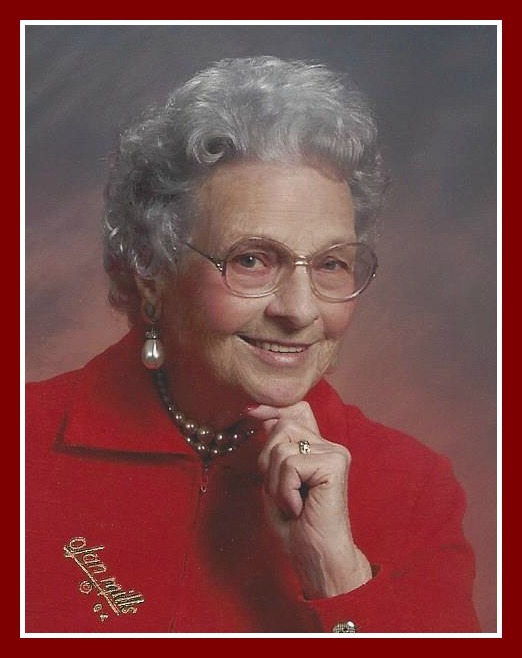 Obituary for Neoma "Cherry" Lola (Mullikin) Knoche | Minnis Chapel, Inc.
Neoma (Cherry) Lola Knoche, 101, died November 25, 2018 at Kenwood Plaza in St. John, KS . Cherry was born February 12, 1917 in Arnold, Nebraska and 2 years later her family moved to Forest Grove, Oregon. She married Clyde E. Knoche on September 22, 1940 in Camas, Washington. Clyde and Cherry lived in Oregon for several years before moving to Stafford County in 1952. He preceded her in death March, 28, 1994. Cherry had been a resident of St. John, Kansas since 1959 and enjoyed being a farmer’s wife and was a hard worker all her life. She was also the former owner of the St. John Greenhouse and Floral and Little Village Restaurant, both at St. John. Cherry loved nature, and spent countless hours tending to her beautiful flower gardens. Cherry loved animals, especially her cats. She cherished time with her family and loved the St. John Community. She was a member of First United Methodist Church, St. John. Cherry was the mother of two sons, Randy of Hollister, CA and Gregg of St. John and two daughters, Cindy Snyder of Bennington, KS and Jody Willinger who preceded her in death December 4, 2014. Cherry is survived by 7 grandchildren, 17 great grandchildren and 9 great great grandchildren. Funeral service will be 2:00 PM, Wednesday, November 28, 2018 at the First United Methodist Church, St. John, with Rev Nathan Gift presiding. Burial will follow at the Fairview Park Cemetery, St. John, where she will be laid to rest by her beloved Clyde. Memorials may be given to Kenwood Plaza in care of Minnis Chapel, P.O. Box 34, St. John, Ks 67576.